Now I can add Bro Yao's Inheritance to the collection. A busy teaching schedule this semester has slowed my poetry blogging routine. Yet, I'm still managing to check out a couple of new books and return to some old ones. 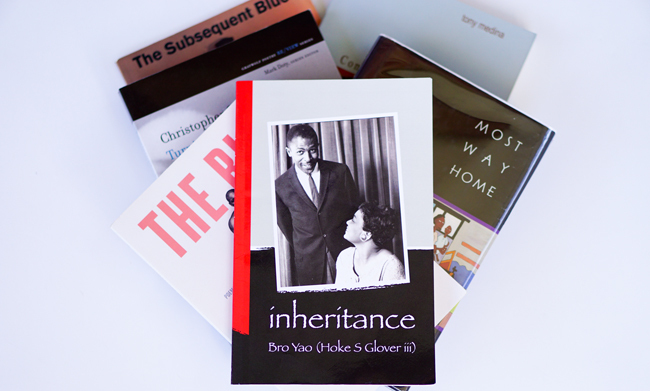 Over the last week or so, I've been carrying Inheritance (Willow Books, 2016) by Bro Yao ( Hoke Glover III). It's a book I'm enjoying, especially in the in between moments of my busier days. Many of the poems are conversational in the sense that I can almost imagine Yao speaking them during an exchange. Speaking them in a poetic way of course. They are also conversational in the sense that ideas or themes from different poems begin to blend together in my mind. Memory. Reflections on a father and mother. Music. Nature. In "buttoning my shirt," he recalls, as a child perhaps, watching his father standing in front of the mirror in the morning preparing for work. Shaving. Tying his tie. And more: while studying his father adjust into a serious facial expression while looking into the mirror, the son begins to "learn how to stare down the day." In "i thought my mama was god," he reflects on how "the songs she sang made the house vibrate, not moans, but something soft and terrible, with power and resonance." Those reflections on a father and mother persist throughout the volume, and we learn that the lessons they passed along or their everyday routines, which were extraordinary feats in the eyes their child, became his inheritance. Taken together, Yao's poems in Inheritance present this wonderful catalogue of precious intangible items passed along from family and his environment. There's also all this proverbial wisdom and these hard truths that permeate the book. In "a tale," a young girl is told that "the country is an empire without blood." However, she knows better: "there's red in the flag and mud on its boots." In "the liar," he points out that he cannot tell the truth because "it is a face of ten thousand expressions." Those lines and others spoke to me as I encountered them between classes or after the drive home and now before heading in to work.